You'll be £14.00 closer to your next £10.00 credit when you purchase German Naval Camouflage Vol I: 1939-41. What's this? For half a century German warship camouflage has been something of a mystery for warship enthusiasts and modelmakers. The widespread destruction of naval archives at the end of the war left little documentation, while the ad hoc application of 'unofficial' schemes in theatres like Norway led to many variegated and frequently altered patterns. This book, therefore, is based on close scrutiny of all available photos, including many only recently discovered, collated with the first-hand testimony of Kriegsmarine survivors. After decades of study, the authors are the world's leading experts, and their work challenges many accepted views, while greatly expanding the general understanding of the subject. The fruits of their labours are presented in the form of exquisite colour illustrations of every scheme and variation for which evidence is available. For major ships these are sometimes only months apart, giving as complete a representation of their camouflage history as possible. There are no speculative views – if, for example, only the starboard side is known, there is no attempt to 'reconstruct' a port side – so all information is reliable. This volume covers destroyers and all larger ships during the early war years, with a second part devoted to 1942-45 planned for completion in 2013. For warship enthusiasts its publication will be a major event, and it is certain to become the standard reference. German Naval Camouflage in its two volumes is the most complete and authoritative set of books ever written on the color schemes used by the Kriegsmarine throughout World War II. The authors have taken great pains in digging out original works from historical evidence. The 100 plates in each book are followed by detailed captions describing each scheme and writing down when it was seen sometimes down to the day. Each subject is precisely depicted from port, starboard and plan views whenever possible, accompanied with rare photographs. As a modeler, I greatly appreciate this extra information as it shows the weathered paint and which sections of the ship were affected the most. What I liked most is the historical introduction in book 1, recounting how and why the painting was introduced, listing and detailing the four types of camouflage, of which the dazzle and splinter are the most cherished by modelers. It was also very insightful to know how the different paint schemes were used to obscure the ship’s type, inclination, range, speed and direction from enemy submarines and airplanes. The books cover the whole spectrum of ships, from the Tirpitz and Bismarck down to flotilla torpedo boats. I highly recommend these volumes for warship modelers and history enthusiasts alike. An essential work for both historians and for modelers or naval wargames players. 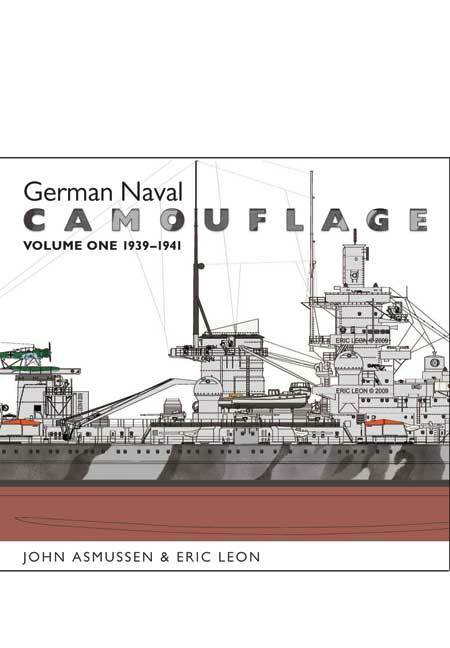 This is volume one of an extremely comprehensive coverage of the camouflage worn by German warships of WW2. The authors and illustrators have provided information way beyond anything normally found in other books. In some instances they have shown camouflage that changed only days apart. It is a brilliant book and well worth having if you like naval books of high quality. They are wonderfully illustrated by Eric Leon working with the author John Asmussen. My rating ***** five stars if you are really into the finest of detail. **** four stars for most people want to read broader information. This is a great reference source to have to hand. The centrepiece is a series of outstanding, computer-generated, colored line drawings. These show not only the ships’ color schemes but their evolving configurations… Other interesting features of the drawings are the detailed views of Kriegsmarine heraldry – not only the flags painted on the decks, but coats of arms on the bows and, in some cases, the sides on turrets… There is also a generous selection of photographs, many of which were new to this reviewer… This fine book undoubtedly will inspire the building of some equally beautiful, and accurate, Kriegsmarine models. This book is the most authoritative and comprehensive volume ever published about the colour and camouflage schemes of the Kriegsmarine during 1939-41. Throughout the book, the superb colour illustrations are dated precisely with appropriate modifications depicted accurately and minutely and all colour schemes are backed up by hard photographic evidence, often reproduced alongside the drawings. This beautifully produced, outstanding book combines first class research with high grade artwork and is highly recommended to all those interested in German warships of the Second World War. Individual colour schemes worn by every major German surface warship during the early years of World War II are described in this well-laid out volume which will appeal particularly to model makers. For unparalleled coverage of Germany's Kriegsmarine in the early years look no farther than 'German Naval Camouflage Vol 1939 – 1941. This astonishing book gives over 100 full colour plates of schemes all precisely dated and backed up by photographs, plus some useful advice for modellers trying to recreate these schemes in miniature. For anyone about to embark on the journey of Kriegsmarine (German Navy) modelling, this book should not be missed. Via beautiful profile and plan (and selective four-view) illustrations, it portrays the many vessels operated by this maritime force in terms of colour schemes and identification marketing, the latter often being in the form of large swastikas and brightly coloured turret tops. Camouflage in general was rendered on many machines during World War Two but it’s surprising as to the extent it was employed on warships, particularly those of Germany. Seaforth Publishing’s book presents the various patterns used on capital ships, heavy and light cruisers and destroyers. The pleasing aspect is that lesser-known ships such as the Z-destroyers get as much attention as historical heavyweights…Bismarck, Tirpits, et al. It’s fascinating to see the shades used on the decks of these ships, as well as the camouflage on hulls and superstructures. The introduction id also engaging in its coverage of RAL colours and their application along with a chapter on the contentious subject of scale colour; it makes perfect sense here, though. Black and white photos also help to appreciate what is being conveyed by the artwork. A superb title. This fascinating book will be a great help to anybody modelling a German warship of destroyer size or greater. All together, a very useful book which makes interesting reading even if you are not building a German warship at the time.